SS Andrea Doria je bila oceanska linijska ladja italijanske ladjiske družbe Italian Line (Società di navigazione Italia). Poimenovana je po genovskem admiralu iz 16. stoletja Andrea Dorii. Ladja je imela kapaciteto okrog 1200 potnikov in 500 članov posadke. 26. julija 1956 je Andrea Doria trčila z ladjo MS Stockholm. Ballard, Robert D. (1997). Lost Liners: From the Titanic to the Andrea Doria the Ocean Floor Reveals Its Greatest Ships. Hyperion. ISBN 978-0-7868-6296-2. Carletti, Stefano (1968). Andrea Doria '74. Gherando Casini Ed, Italy. Gentile, Gary (1989). Andrea Doria: Dive to an Era. Gary Gentile Productions. ISBN 978-0-9621453-0-8. Gladstone, Eugene W. (1966). In The Wake of the Andrea Doria: A Candid Autobiography by Eugene W. Gladstone. McClelland and Stewart Limited, Canada. Goldstein, Richard (2003). Desperate Hours: The Epic Rescue of the Andrea Doria. John Wiley & Sons. ISBN 978-0-471-42352-2. Haberstroh, Joe (2003). Fatal Depth: Deep Sea Diving, China Fever and the Wreck of the Andrea Doria. The Lyons Press. ISBN 978-1-58574-457-2. Hoffer, William (1982). 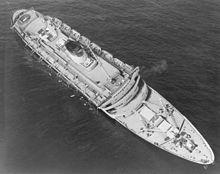 Saved: the Story of the Andrea Doria-The Greatest Sea Rescue in History. Simon & Schuster. ISBN 978-0-517-36490-1. Kurson, Robert (2004). Shadow Divers: The True Adventure of Two Americans Who Risked Everything to Solve One of the Last Mysteries of World War II. Random House. ISBN 978-0-375-50858-5. Kohler, Peter C. (1988). The Lido Fleet. Seadragon Press. ISBN 978-0-9663052-0-3. Mattsson, Algot (Translated from Swedish by Professor E. Fisher and edited by Gordon W. Paulsen) (1986). Out of the Fog: The Sinking of the Andrea Doria. Cornell Maritime Press. ISBN 978-0-87033-545-7. McMurray, Kevin F. (2001). Deep Descent: Adventure And Death Diving The Andrea Doria. Pocket Books. ISBN 978-0-7434-0062-6. Simpson, Pierette Dominica (2006). Alive on the Andrea Doria! The Greatest Sea Rescue in History. Purple Mountain Press. The New York Times, "Doria Skin Diver Dies, Was In Group Set to Film Ship-Oxygen Supply Cut Off", August 2, 1956, Page 13. Andrea Doria. Lost Liners: PBS Online. Čas zadnje spremembe strani: 08:51, 18. december 2017.